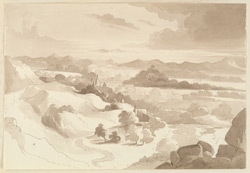 Sepia wash drawing by Harriot Mary Woodcock (b. 1807) of a landscape in Bihar, dated January 1831. The image is inscribed on the reverse: 'View of the Ram Gya from the Burrum Jooin Janry. 1831' and on mount: 'HMW'.